as filling as an organic cereal. In the office just before the afternoon slump, in the gym in the middle of the last set, or anywhere on your run. Do you suddenly feel like your energy level goes down the drain? Crank up your energy from tired to wide awake with just one bite: Natural caffeine from the guarana plant combines with a whole range of crisp grains, nuts and seeds. Fruity fresh with choice fruits and plant syrup. The perfect blend of energising carbohydrates and valuable fats in three delicious varieties. Naturally organic and completely free from artificial rubbish. Which Energy Bar will you try first? Because caffeine alone lets you down. real energy from real ingredients. Natural caffeine for maximum energy. Fibre so you can forget the cravings. You can also find agave syrup, rice syrup, whole grain rice crispies and cranberry pieces in our Energy Bars. There has never been a bar with more energy. A little berry with a big surprise. Energy directly from nature. 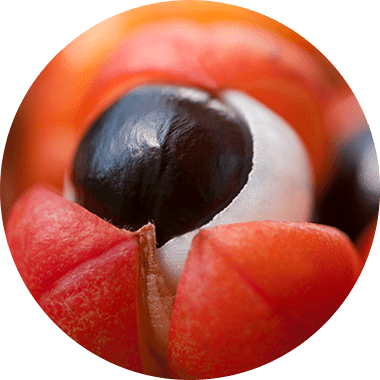 Guarana is a real pick-me-up. This berry has three times the caffeine of the coffee bean. A real powerhouse that will not let you down. Because this berry's caffeine is released gradually. What exactly does that mean? Caffeine from guarana can remain active in the body for up to six hours. Long-lasting energy instead of a short-lived coffee kick. The energy kickstart for every challenge. So you can still make the deadline. So you can give 100% again. As a jumpstart into a day full of challenges. 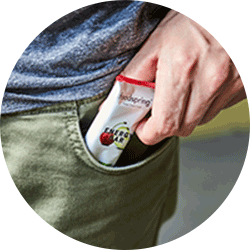 Energy to go, always handy wherever you are. May contain traces of egg protein, soy and milk (incl. lactose). Contains caffeine (144 mg/100 g). Not recommended for children or pregnant women. Despite careful monitoring, this product may contain hard pieces of fruit, nuts etc. 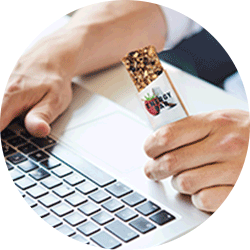 Our Energy Bars combine nuts, seeds, fruits and caffeine from the guarana plant. The perfect snack for in between meals. Always on hand when you run out of steam. In the office, during endurance sports or after a hard set in your workout. How much caffeine is in an Energy Bar? 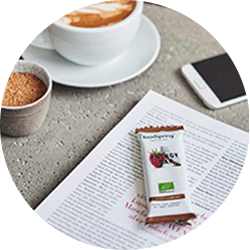 An Energy Bar gives you just as much caffeine as you get in a double espresso. In fact, there are many more nutrients in these delicious bars: readily available carbohydrates, magnesium, valuable fats and fibre that won't weigh you down. A perfect blend so that you can overcome your challenges. Where does the refreshingly tart taste come from? 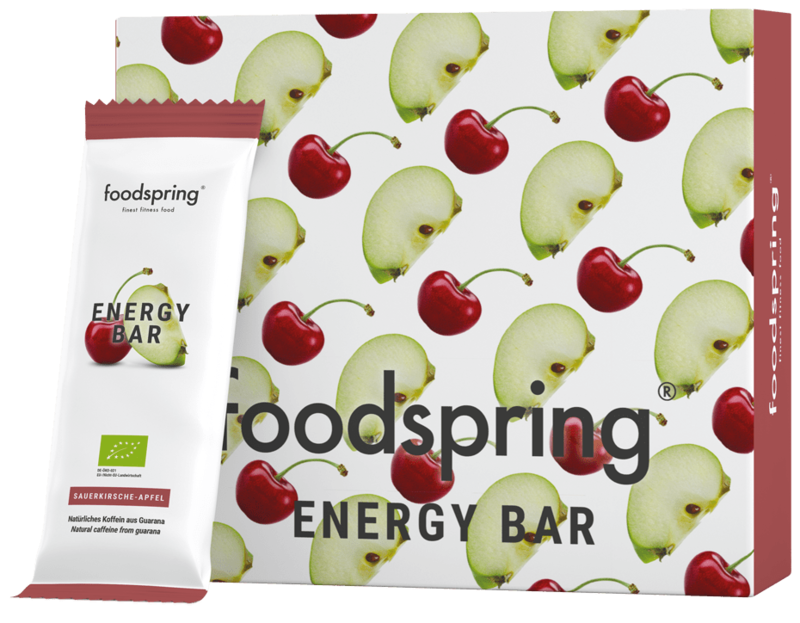 With our Energy Bars, we have made sure that the sweetness from fruits and syrups will not overwhelm your taste buds. Guarana adds a refreshingly tart note. Natural caffeine is a real taste experience together with crunchy nuts and sweet fruits. When should I eat the Energy Bars? You can eat the Energy Bars whenever you need an energy boost. Before your workout, they help prepare you for exertion. And during a long endurance workout, they help keep you on track. It is better not to eat our delicious Energy Bars right before you go to sleep. Fortunately, you can still eat our Protein Bars. Why Energy Bars rather than a double espresso? Because our Energy Bars have so much more to offer than just caffeine. They are packed with valuable nutrients that will give you more than just a short burst of energy: readily available carbohydrates, magnesium, valuable fats and fibre that won't weigh you down. And don't you think that an espresso is pretty hard to fit in your pocket? Are these Energy Bars really natural? Yes! 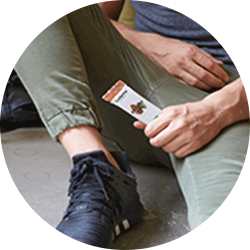 Our Energy Bars contain 100% natural ingredients and no chemical additives. That's why they proudly bear the organic label for sustainable agriculture. With a clear conscience, you can really enjoy your snacking. Energy Bar will be back in stock shortly.